If the outlawing of separate liveries came in as the number one silly rule for 2000, another new rule - keeping a tight lid on the number of new F1 entrants, sticking to a maximum of 24 cars - must have been candidate for the runner-up spot in terms of silliness. In modern-day managerial terms - or Bernie-speak - this would probably be called maximizing the available budget to the highest commercial targets or creating the optimum atmosphere for professional constuctors and their sponsors to thrive in. In any case, in 2000, a complete section of the FIA sporting regulations was effectively torn out of the rule book: the pages concerning the intricacies of prequalifying. Back in 1989, the year topping the all-time entry charts with 39 cars entered each race on a regular basis, there were no such rules forbidding the likes of Rial, AGS, Onyx, or EuroBrun fielding modern-day kit cars in their ill-fated attempts to mix it with the F1 greats. For the little people this meant getting out of bed early Friday morning with the prospect of a 30-minute all-out bash for four admission tickets to qualifying proper. Such were the days of prequalifying. Messrs Larini and Foitek couldn't avoid the hectic half-hour as their teams belonged to the group of constructors that had been seriously underperforming in the final half of the previous season (Osella, EuroBrun, Zakspeed, Coloni), or plainly weren't there (Rial's, Dallara's and AGS's second car, Brabham, Onyx). So at 9 a.m., Thursday - this is Monaco, remember - the Italian and the Swiss took on the competition of twelve others: Brundle, Modena, Ghinzani, Caffi, Moreno, Raphanel, Schneider, Aguri Suzuki, Johansson, Gachot, Weidler and Joachim Winkelhock. Invariably the same names ended up bottom: in 1989 Winkelhock, Weidler and Suzuki never survived the fractic 30 minutes. On occasion there were surprise victims, like Martin Brundle failing to make his Brabham work in Canada and France. Foitek found himself on the wrong side of the equation most of the times as well. Only at the first GP in Brazil he managed to jump the prequalifying hurdle, but failed to make the cut on Saturday anyway. He was out after Spa, and not even the influx of Jägermeister money could help prevent that. Especially the performance of the Brabhams, Caffi's Dallara and Larini's Osella - the usual suspects to make it to qualifying - bore out the peculiar rules of prequalifying. Whenever they incurred no problems during the early-morning session they would be found high up on Sunday's grid, eclipsing the efforts of teams that were saved from prequalifying. For instance, Larini managed to prequalify on seven occasions and went on to qualify easily on every occasion. But with the Brabhams taking two of the four available qualifying slots in the first eight races of the 1989 season, many of the other contenders could do nothing but wait until the second half of the season, when the nominations for prequalifying were now decided on the season's first-half results. The shake-up presented Larini with more opportunity to prequalify, which he duly did. Come end of season he was a regular prequalifier finishing up in the top ten on Saturday. 1990 saw the continuing of the prequalifying saga, this time with the Italian Life outfit providing many dubious headlines, while Pedro Chaves and his Coloni were the laughing stock of 1991 prequalifying. 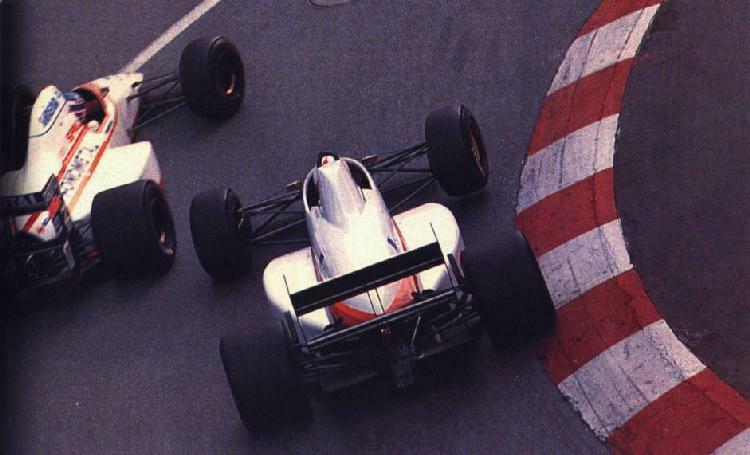 The abysmal Andrea Moda project was the joke of the Friday morning session in 1992 after which the 107% rule was introduced and the number of entrants rapidly shrinked to the current 22. The new-for-2000 rule will prevent the figure ever growing higher than 24. So 1989 remains on top of the entry charts and will forever do so.